Friday was the 100th mystery object and I am considering making it the last one, since I’m finding it hard to come up with new objects every week. Moreover, I find that I don’t have time to keep up with all the other things I want/need to do. However, I may keep FMO running for a bit longer with a slightly different format for the answer (since they’re what take the most time to write). So here’s the quick answer to Friday’s object, or should I say objects. F = Leopard Panthera pardus (Linnaeus, 1758). So congratulations to everyone who had a stab at identifying these mandibles – since all of you got some of them right. If you have any thoughts on the continuation of the Friday mystery object, please feel free to let me know in the comments section below. Perhaps I should do a monthly mystery object or have them in a more ad hoc way as I find interesting objects? Your input would be of great help. Monthly and/or ad hoc would both save you time and us too! (Sometimes I get so embroiled in the search that I neglect other important tasks on the weekend like washing dishes, garden chores, etc). Fascinating series though and I do hope you can keep it up. 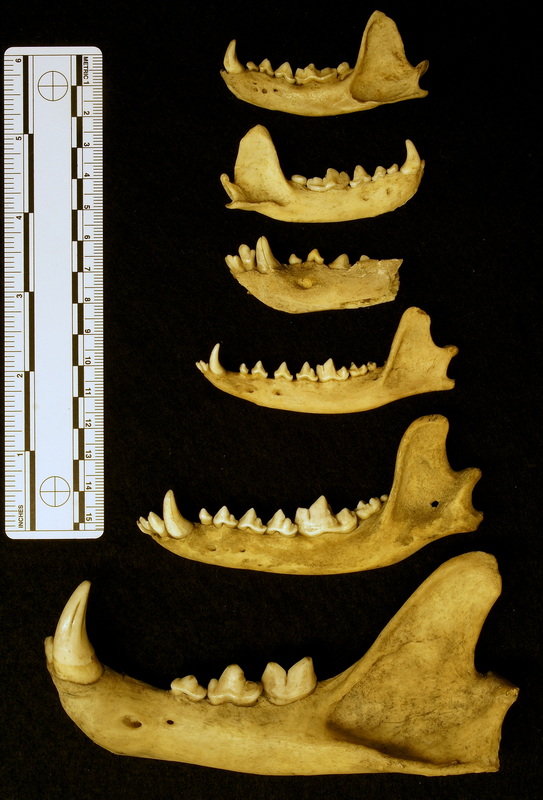 How do you tell the difference between a dog and a fox jaw ? The dog one looked most like my fox jaw. I really enjoy the mystery object but I know it must take a lot of time. I’d hate for FMO to end, maybe Ad-Hoc would be a good alternative? Obviously the self-centred view is that you should keep it weekly! But the flipside of that is that I know I don’t always find time to even look at it each week, so preparing it and the answer each week must be incredibly time-consuming, let alone answering the many questions and guesses/deductions of your readers. As others have said, maybe an ad hoc feature when you happen to be working on something especially interesting? I only discovered this FMO series a few months ago, so it has been a short but very interesting experience for me. Thank you for the time and effort you have put into it. On the plus side, there is a large archive of previous FMOs for me to attempt. If you ever get the time to write up those notes on bone identification that you mentioned a week or so back, that would be most welcome, as would the occasional new FMO. Congratulations on making your century. I think it would be a shame to lose the FMO, despite my spectacular lack of success in identifying most specimens. One of the things that is nice is the way things pop up from time to time from elsewhere in the Horniman’s collections but which have a natural history connection, even if only a picture on the thing! However, the headhunters’ basket does rather stick in my memory – great for both the skull experts and those interested in anthropology. It’s rather nice when you put up something that is quite easy and your expert readers join in the fun and provide cryptic clues. But the FMO has been a tad skull-heavy of late and leaves this non-biologist not even able to make a guess, based on the mechanics, because it’s obvious it’s a carnivore, or whatever, but how to get beyond that? It also seems to me that your expert readership really are very expert, and a potential resource for you when sifting through all those boxes! So an occasonal Help This Is A Real Mystery might be nice to open to scrutiny the evidence-based decision-making process. Would be good for Ask A Biologist to link to it? Oh, the occasional anthro-bio MO would be really cool, especially for high days and holidays. Just as a thought, could you use NatSCA to encourage more guest bloggers presenting FMOs? Or is that just as much work?